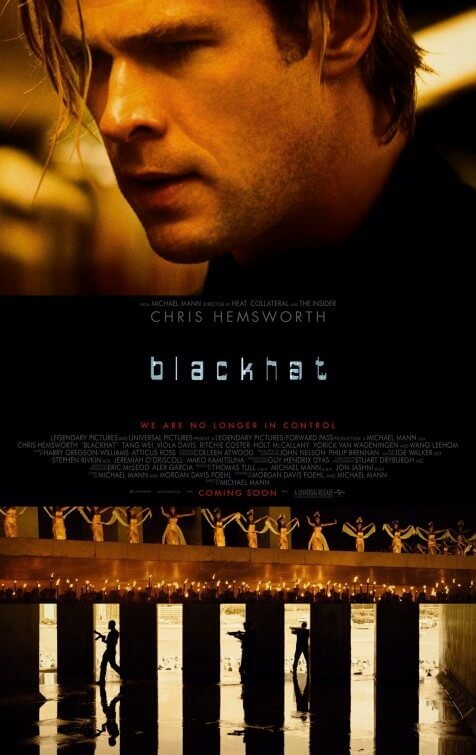 It’s both a blessing and a curse that Blackhat opens in the wake of the much-publicised Sony hack. The relevance it now exhibits concerning major cyber-hacks by ruthless criminals is unprecedented, and gives the film more of a public awareness because of it. However, it’s a negative because if there’s anything the incident at Sony has taught us, cyber-hackers are now being seen as much more of a major threat than ever before. The idea that highly classified information can be available to criminals at the push of a keyboard is much more frightening now because we have seen what damage it can do. It’s a frightening new side of terrorism, something that director Michael Mann cannot seem to comprehend this time round. Instead, the man who previously brought more intriguing properties such as Heat, Collateral and Public Enemies to the screen plays Blackhat more as a conventional spy thriller, only with more laptops. He basically has us watching the most beautiful computers hackers that casting agents can find typing on computers for a good two-and-a-bit hours; which, unless you’re into that field of technology yourself, makes for an increasingly dull experience for everyone else. After all, two-and-a-bit hours is FAR too long for a film like this, where the most exciting thing to happen is a password login. You could have easily cut out at least half an hour of footage and nothing of vital importance would have been missed; it would certainly help the film drag a little less, getting less caught up in expositional dialogue and actually developing these characters we’re supposed to care about. Overall, it’s definitely a style-over-substance movie which, if you’re already a fan of Mann’s heavy use of shaky-cam and digitalised cinematography, should hold up well enough. But if you’re not, then it’s going to be a heavy drag; it’s used in every scene, even when it’s not called for, and can get more tiresome than you can probably imagine. Some action scenes prove effective, such as one later in the movie involving a slow-motion explosion that’s actually very well done, and though it ends on something of an anti-climax there’s a lot of effort put into staging this particular set-piece (even though it makes no real sense when you start to see it in practise rather than theory). This is certainly not Mann’s finest work, but at least fans of the director will be satisfied with how he can still stage an action scene competently.